Sources in South Korea have announced Hyundai’s plan to unveil the all-new Equus luxury sedan in December. It’s the second generation of this model and it comes with a new look, more tech and more efficient power plants. At least one of the new engines is more frugal, the 3.3-liter turbo V6 which is said to be around 15 percent better on fuel. Its power rating has yet to be officially confirmed, but it could have 365 hp. 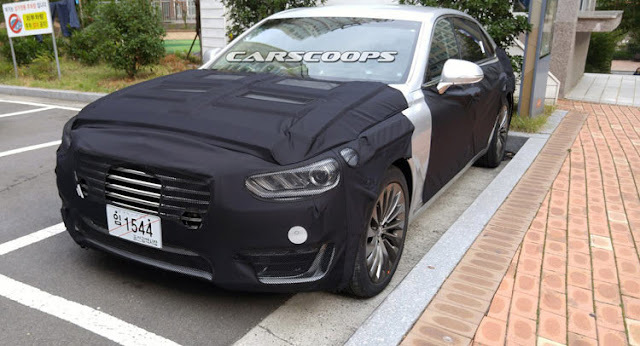 According to TheKoreanCarBlog, after the December reveal in Korea, so it’s not unreasonable to assume the US market version could debut at the New York Auto Show next April. For the new Equus to succeed, it must first exude an overwhelming sense of being expensive, imposing, just like the best luxury rivals out there. It will try to go against the new tech-packed BMW 7-Series and Mercedes S-Class, and there’s also an all-new Lexus LS in the pipeline somewhere too, offering a better value for money. The Lexus model may be previewed by a concept we’ll get to see very soon. This way, Lexus has the upper hand as will have time to study them, all while gauging public reaction to this new study that they’re teasing.